Comments Off on 24th Century Terrorist Group Killed Osama bin Laden? According to German television, Osama bin Laden was taken out by a 24th Century terrorist group called the Marquis. This amazing story was first carried by TrekMovie.com and then reported by CNET (a wholly owned subsidiary of CBS news). 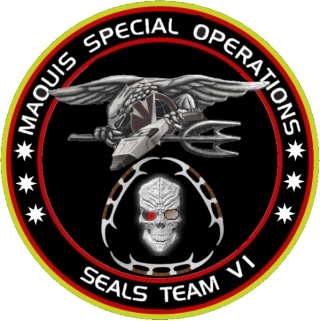 German TV reported that bin Laden was killed by Special Forces from an elite military group with this logo. Locher didn’t seem to notice (or care) that the skull in question was from a Klingon and included a bolted-on eyepatch. He and N24 also appear undeterred by the emblem’s inclusion of a phaser, 3 Klingon bat’leth swords and the word “Maquis.” The original Maquis were a French resistance guerrilla group who (ironically) fought against German occupation in World War II. That group inspired the name for the Maquis seen in Star Trek: The Next Generation and Star Trek: Deep Space Nine, who fought against Cardassia in former Federation colonies. I have no reason to believe that anyone at N24 was waterboarded for this unfortunate Google search. However, one can only imagine that the real Navy SEALs might just chuckle if they heard that they were all, in fact, extra-terrestrial beings. And, um, terrorists.